In the world of produce, there are ingredients we reach for again and again without a second thought; we instinctively know what to do with potatoes, garlic, tomatoes, and cucumbers. But what about the others—the ones we may appreciate for their beauty or unusualness, but leave behind because we have no clue what to do with them? Take the artichoke. We ooh and ah at its stand at the farmers’ market, but how many of us know how to eat one? How to cook one? We’ll walk you through it. That’s right: The artichoke is indeed a flower head, consisting of a cluster of small budding flowers surrounded by special leaves, called bracts. The head sits upon an edible base, otherwise known as the heart of the artichoke. The heart, leaves, and stem are the edible portions of the plant. 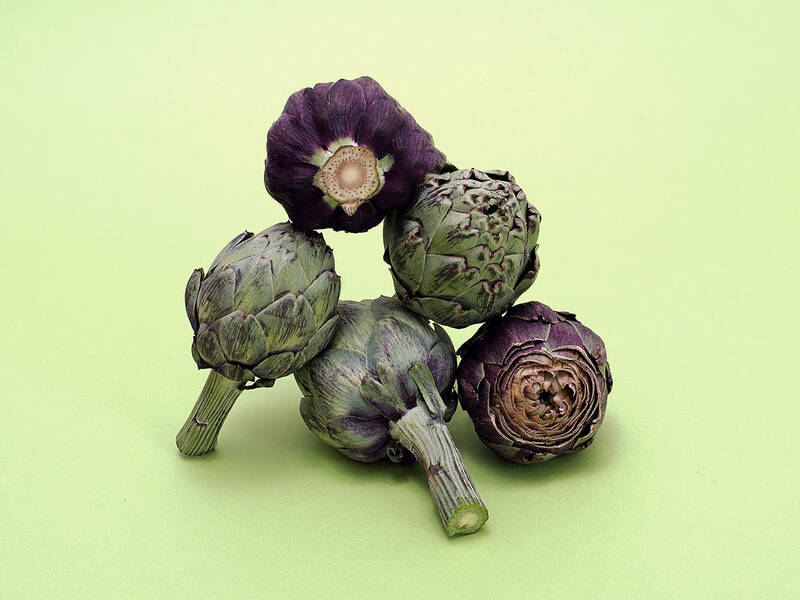 The very center of the flower head consists of prickly purple leaves and a fuzzy choke that shouldn’t be consumed (they could, indeed, cause you to choke)—they are discarded before or during the eating of the remaining artichoke. Baby artichokes (in Europe, these are young artichokes, harvested earlier; in America, they are simply smaller artichokes that are harvested at the same time as the large ones), if you can find them, are more tender and don’t contain a choke at all, so require minimal prep and can be eaten whole. So, How Exactly Do I Eat It? There is much confusion when it comes to preparing and eating artichokes. Many of us have only eaten jarred hearts, or those prepared for us in a restaurant or at a friend’s house. But, preparing artichokes—and eating them—is much more fun and less challenging than you think. Artichokes and their hearts can be steamed, roasted, sautéed, and boiled. But first, you’ll want to remove the outer leaves, trim and peel the stem, cut of the top third of the head, and trim the top tips of the leaves, which contain thorns. Just be sure to coat any cut edges in lemon juice or submerge the artichoke in lemon water to prevent browning. Take a look at the video to see how it’s done for yourself, as well as how to remove just the heart. As mentioned earlier, you can eat the leaves, but don’t start chewing away on one! You won’t get very far. Instead, use your teeth to scrape out the tender meat inside each leaf. The outer leaves are tougher and only have a small portion of edible material, while the inner leaves are much more tender and fleshier. They taste especially great when dipped in melted butter or a sauce, like aioli. The heart can be eaten whole, as can the stem, after cooking. Just be careful to peel the outer, fibrous parts off thoroughly and trim off a good portion of the woody end. Artichokes are in season from March through May, and again briefly in late summer and early fall. To buy the best ones, you’ll want to give them a good squeeze and listen: Do they squeak? Then you’re on the right track! That means the leaves haven’t lost their crispness, and this matters more than if the leaves have some blemishes or imperfections. Artichokes last for about a week refrigerated, but you won’t want to wash them first. Simply cut off a small slice of the stem, sprinkle it lightly with water, and transfer it to a plastic bag perforated with holes. Why not start with our latest recipe for Goat Cheese-Stuffed Artichokes? We’ll be featuring new artichoke recipes all week, so check back and stay tuned for more great artichoke recipes! What are you making with your farmers’ market haul this week? Tell us in the comments, and upload a picture of your creations for all to enjoy!